Samsung R7 review | What Hi-Fi? A dinosaur egg prop from the set of Jurassic World? An unplugged lava lamp? Try again. The R7 is a Bluetooth and wi-fi (multi-room ready) speaker. Samsung calls it a ‘standing model with deeper bass', with the aim of delivering 360-degree sound. “How?” you might ask. 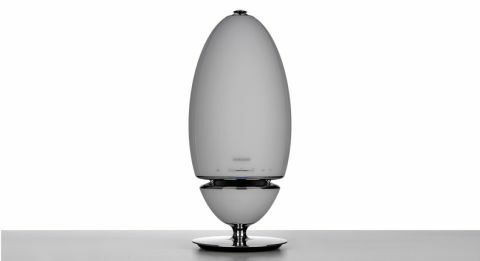 While the elongated-dome shape was designed to facilitate omnidirectional dispersion, it’s mostly down to the 12.5cm downward-facing woofer firing sound towards a conical base and out in every direction, and a 2.5cm upward-facing tweeter on the top. Peek through the gap and you can see Samsung’s ‘ring radiator technology’. It’s more of a showstopper than its podgier R6 sibling, and it’s nice to see the offer of big-scale sound in something that’s not a bland box. The base has a rather small footprint, although Samsung will point you to its quirky tripod stand. Either way, it’s best to keep it out of reach to avoid damage to the semi-exposed tweeter. It requires some willpower to not stroke its stylishly smooth rubbery plastic, and touch controls across its waistband give it a streamlined look. Its reflective base is equally unspoiled, being free of any inputs or sockets. And by ‘any’ we mean not even an ethernet port, so all network playback – that of your digital library up to 24bit/192kHz, streaming services and internet radio – is over wi-fi. There’s also Bluetooth connectivity and a TV SoundConnect feature so the R7 can play audio from a Bluetooth-compatible Samsung TV. Streaming services include the likes of TuneIn, Spotify Connect and Deezer, with the more offbeat 7digital and 8tracks in Samsung’s Multi-room app. The only oversight is Google Play Music and Tidal – both of which are on Sonos’ radar. It’s hardly surprising that the R7 shares its sibling’s weighty, laidback sonic character, its decent insight and strict balance serving up a sound that’s easy to listen to whether you play Avicii’s crashing beats or Sixto Rodriguez’s crooning nasal twang. But where there are ups, there are downs. Like its mini-me, it struggles to get into the jollity of I Wonder, let alone get pumped up for Martin Solveig’s Intoxicated – it’s not quite the pick-me-up it is through the Sonos Play:5, which is a crisper, more upbeat listen and takes the Samsung for clarity and bass punch too. While it pounds out plentiful (and deep) bass, it can feel loose and muggy, and up top the treble has a coarse, gravelly texture to it that not even a long run-in can purge. To boot, we find it flustered in high volumes, dynamically flat at lower volumes, and lacking a happy medium. So why buy the R7 over the R6? In covering every angle of the room, the bigger unit offers a larger scatter of sound and has a bigger presence. But size and scale aside, we’d take an R6 (or two if you’re ready to dip your toe in the multi-room pool) for its cleaner sound and more competitive price. In a market where speakers have to fight even against their own, sonic success is the key to survival. So while the R7’s app is excellent and hi-res, multi-room and streaming service features are a highlight, overall our praise stops short of ‘good’.